Hallmark Keepsake Ornament: Disney Doc McStuffins And Chilly Just $4 Down From $15! You are here: Home / Great Deals / Amazon Deals / Hallmark Keepsake Ornament: Disney Doc McStuffins And Chilly Just $4 Down From $15! Here’s a nice Amazon deal. Hallmark Keepsake Ornament: Disney Doc McStuffins And Chilly is an Add-On item and is only $4 down from $15! Get yours now while it lasts! A Hallmark Keepsake ornament is much more than an ornament-it’s a little work of art that tells a big story. From people and things you love, to memories of the past, to capturing today’s important moments, a Keepsake celebrates the story of you! You need this ornament, STAT! When Doc McStuffins wears her stethoscope, her animals come to life. Influenced by her doctor mom, she gives her pals check-ups and makes them feel better when they are sick. Now, that’s good bedside manner. 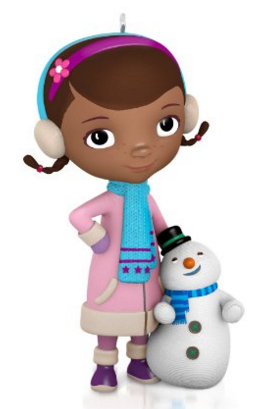 Perfect gift for Disney Doc McStuffins collectors and fans of all ages.